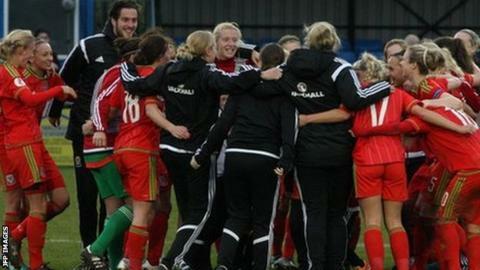 Wales women were denied victory as Rachel Shelina's goal seven minutes from time secured a Euro 2017 qualifying point for Israel. Jayne Ludlow's side fell behind to Lee Sima Falkon's goal after 25 minutes in Ramat Gan before Manchester City striker Natasha Harding scored two second-half goals to put Wales ahead. But they were denied their second win of the campaign by Shelina's late goal. Third-placed Wales are now five points behind Group eight leaders Austria. Wales, playing their 150th competitive match, had 12 efforts on goal during the game. They had earned their first win of the campaign on Thursday, beating Kazakhstan 4-0 to move above Israel in the group. Ludlow's side, who next face Kazakhstan away on 12 April, remain two points above fourth-placed Israel, who have a game in hand. Only the eventual group winners are guaranteed automatic qualification to the tournament in the Netherlands. Israel: Shamir, Ravitz, Bar Oz, Sofer, Shelina, Tvill (Sendel 66), Falkon, Fridman, Sade (c) (David 47), Barqui, Shahaf (Nakav 86). Subs not used: Kadori, Efraim, Avital, Metkalov. Wales: Evans, Ingle (c), Roberts (Estcourt 83), James, Fletcher, Harding, Fishlock, Rowe, Walkley (Bleazard 46), Ritchie (Jones 46), Ward. Subs not used: Price, Green, Lawrence, Hinchcliffe.